Frank and I have a deal when it comes to preparing food — he pulls something out of the freezer and I figure out what to do with it. If he doesn’t do it, he’ll then nuke something I’d made earlier from the freezer. It works out well for us. I enjoy cooking and coming up with what to do whatever he pulls out. Anyway, a couple of days ago he brought out one of the Chantecler chickens that we slaughtered last summer. We should have let them grow another couple of months, because these are little chickens. 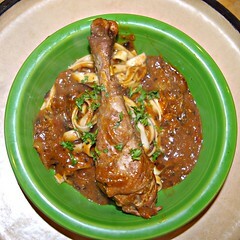 I decided to make Coq au vin because we love it. (What’s not to love with all that wine?!) I use the standard Joy of Cooking recipe, except that because I try to use all of my own stuff, I always have lots of substitutions. This came out pretty tasty, so I thought I’d document it for future reference. First, take apart the whole chicken into parts. Then brown each piece in bacon fat. Remove them onto a plate and cover to keep warm. I cooked the veggies in bacon fat for about five minutes. Add 1/4 cup of whole wheat flour and cook the roux for about five minutes. I used the can of tomatoes and the dried tomatoes in place of tomato paste, again because I’m trying to use what I have. I’ve only tried to make tomato paste once. It took forever and then I burned it, and I’ve yet to try again. Maybe this year. But we got the deep tomato flavor anyway with my substitution. 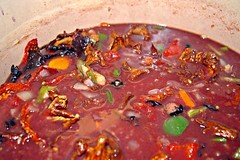 Bring to a boil, then add the chicken parts back with any liquid, cover the pot and simmer for about an hour. Because I used so many dried mushrooms, the sauce was pretty lumpy, so I pulled all the chicken out as well as the bay leaves, then hit it with a stick blender. 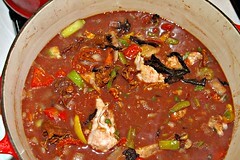 Then I put the chicken back in to let it all simmer together for a while. 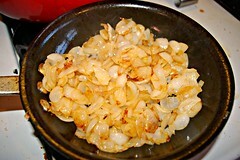 In a separate pan, caramelize two cups of pearl onions in a bit of bacon fat and butter. I didn’t do button mushrooms that the original recipe calls for because we certainly don’t have fresh mushrooms in the middle of February in New Hampshire, but I think the black trumpets and chanterelles gave this enough mushroom flavor anyway. Add the onions to the pot and stir well. I served it on top of noodles and it was really yummy. The house smelled so good, too. Yum. I really like the flavor of these Chantecler chickens, even though they are pretty small birds. This year we’ll let them grow a few months longer, but their diet of grass and bugs makes for a really flavorful bird with a really nice texture. I was worried the meat would be tough, but it was really lovely. So this is Coq au vin, Mack Hill Farm style. We’ll never have our own pepper salt or bay leaves, but we really need to work on that zin. Every where that I’ve been reading says you need to give them feed besides the grass pasture and bugs they find, is this true?